By now, growers have harvested much of northern California's rice. Most of it is already in the rice mill. 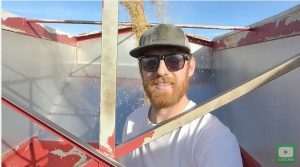 While prices were low this year, production has been very good, according to Matthew Sligar, a third-generation rice grower in Gridley, up in Butte County. Matthew Sligar, "How Rice is Harvested." “Yes, we just got done with rice harvest. We are chopping the rice straw that is left in the fields. We're disking it in to aid in decomposition,” Sligar said. Northern California rice growers dedicate the winter months, and even the early season months when fields are first flooded, to help migratory birds whose original habitat has been taken over by cities and expanding neighborhoods. Birds by the millions - including ducks, geese and shorebirds - rest, feed and rear their young in rice fields during their annual migrations. “Our fields turn white like snow from the down floating feathers left behind by birds,” Sligar said. And yet, due to global oversupply, rice prices are trending lower this season. “We had to put our rice into a marketing pool because we wanted to guarantee a home for it,” Sligar said. “We did not want to gamble on the cash market. We haven't seen the returns yet; however, I got a great yield, and I hear most of Northern California got extremely good yields." "Hopefully, that will make up for some of the low price, and we might make some money. When you get a good year, you’ve got to save that money for bad years like this year, just make it through to next year,” Sligar said. Besides farming rice, Sligar is a cyclist and a social media blogger. He produces great videos on all segments of the rice industry. “That's one reason why I started Rice Farming TV because whenever I'd be at a restaurant or some spot socializing, someone will say, ‘What do you do?’ I tell them that I farm rice. ‘Rice? 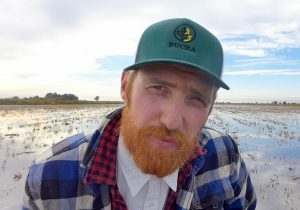 Where do you live?’ I say, ‘I live in California.’ They don't know that rice is grown in California, but it's the best,” Sligar said. Click below to view Sligar's video, "How Rice is Harvested!" Also, in Sligar's repertoire is the best way to surprise someone you love in the middle of a busy rice season, in The Mile High Surprise! View more videos at ricefarmingtv.com.